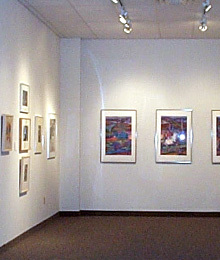 AAWR produces approximately six to eight exhibitions each year at its main gallery in University Circle and also at various other regional venues. All exhibitions are free and open to the public. In addition to showing the works of our Archived Artists, there are exhibitions addressing specific themes and other shows featuring community artists. AAWR has recently produced groundbreaking exhibitions on timely social themes which inform and educate the public. These shows include the Seeing Green environmental art exhibits in 2010 and 2011 and Art Interprets Alzheimer’s in 2012. A membership-based organization, the AAWR also presents two members’ shows each year which give both general members and Archived Artists the opportunity to exhibit and sell their artwork. View our current gallery exhibition.